Being various and sundry interpretations of hit points & death. By dying in the following examples I mean losing one HP per round. Rules that allow dying characters generally provide some way to stabilize the dying character, either by performing an action or using a skill. Healing magic will also generally stabilize a dying character. Classic. Dead at 0 HP. Monsters and PCs are treated the same. Anyone can be knocked unconscious by bringing them to 0 HP with nonlethal damage. See below for the exact OD&D wording, which, as usual, is open-ended and ambiguous. 3E. Disabled at 0. Unconscious and dying below 0. Dead at -10. Instant death if 50 or more damage is taken at once and a DC 15 fortitude save is failed (source: D20 SRD on death). Dead if constitution is reduced to 0 through drain or by taking constitution damage (source: D20 SRD on ability damage). Pathfinder is similar, but characters are dead at negative HP equal to their constitution score rather than at -10 HP (Pathfinder Core page 189). 4E. Dead at negative ½ max HP or 3 failed death saves. Incapacitated at 0 HP. A death save is required every round if a PC has 0 or fewer HP. Note saving throws in Fourth Edition are unrelated to either level or ability scores: there is always a 55% chance of success. Monsters are dead at 0 HP. 4E PHB page 295. Castles & Crusades. Unconscious at 0. Harder to heal between -1 and -6, but not dying. Dying at -7 to -9. Dead at -10. Feels like AD&D, but more fiddly. C&C PHB page 134. When a character (or creature) suffers damage, the amount of damage is deducted from the character’s current hit points. When hit points reach 0, the character becomes unable to take any action, and in most cases falls completely unconscious. The character becomes mortally wounded at -3 hit points and will die in d10 minutes. No healing, magical or otherwise, can prevent death at this point. Death is instantaneous at -4hp. This is surprisingly fiddly; before double-checking the text, I assumed LotFP was just dead at 0. Crypts & Things. When HP is gone, characters start taking constitution damage. Any constitution damage requires a save or the character falls unconscious. I don’t have a copy of this, so I am relying on the review over at Tenkar’s Tavern. ACKS. 0 HP requires a roll on the wounds table which may lead to anything from unconsciousness to injury or death (ACKS page 104). There are many potential modifiers to this roll, so the system looks somewhat fiddly, though I haven’t seen it used in play. DCC RPG. Dying at negative HP, dead at negative HP equal to character level (corollary: 0 level characters are dead at 0 HP). Any character that falls to negative HP but survives loses a point of stamina permanently. DCC RPG Open Beta Page 78. Robert Fisher: Classic D&D injury table. When a PC is brought to 0 HP, they must roll on the 2d6 injury table. Results include no effect, severed limbs, and instant death. Most monsters are dead at 0 HP, but important NPCs might get to roll on the table. See also Trollsmyth’s variant. Ramblings of a Great Khan: Save or die at 0 HP. When a character is reduced to zero HP, they may make a saving throw versus death ray (or whatever category is closest in the game you are playing). On failure, the character is slain. On success, they live but are knocked unconscious. There is a similar idea in this comment: the save is done after combat rather than immediately. Any time a PC runs out of hit points that character is allowed a saving throw versus Death if they haven’t already failed a saving throw to get 0hp. If the roll is made the character is at 1 hit point. At the Labyrinth Lord’s discretion they may also be stunned, unconscious, comatose, feverish, nauseous, mangled, bleeding, or otherwise in a world of hurt. If the saving roll fails, see the rules for replacement PCs below. A house rule used in the World of Silver Blade is that characters brought to zero hit points or below are wounded and out of the fight, suffering ongoing penalties until the injury is healed, regardless of hit point recovery. This is similar to Robert Fisher’s injury table, but a wound at 0 HP is assured. I don’t generally use wound tables, because the idea of mutilation freaks me out. I don’t need that level of detail in my games. I’m not categorically opposed, however. The simplicity of Robert Fisher’s injury table, for example, is very attractive. [HP is] the number of points of damage the character could sustain before death. Whether sustaining accumulative hits will otherwise affect a character is left to the discretion of the referee. My current 4E hack game is using the AD&D rules (unconscious and dying at 0, dead at -10). If I were to start a classic D&D game right now, I would either use dead at 0, Robert Fisher’s injury table, or allow a saving throw to be knocked unconscious rather than die outright. I would probably avoid any option that required bookkeeping. Anyone know of other interesting death & dying house rules floating around? This entry was posted in Uncategorized on February 18, 2012 by Necropraxis. I didn’t go into full detail about dying in On Hit Points and Healing (I should fix that). * when hit points reach zero (you’re completely out) you die. I haven’t bothered with dying mechanics, though I may allow a skilled enough healer to bring you back if they reach you in time. * when Hard To Kill (HTK) exceeds remaining hit points you are incapacitated. Anyone who wants to kill you can, pretty easily (coup de grace rules, but even normal attacks now go directly to hit point damage rather than Hard To Kill). Thanks for that link. I had not read that article before. Whether you like hard-to-kill to regenerate quickly or slowly depends on if you want more tactical gaming or less, I think. This is also related to the recent meme of combat as war versus combat as sport. A critical matter in ACKS is that no roll is made on the wounds table until aid is given; this means that the roll is avoided in all cases where no aid is ever given. Since this is frequently the case with monsters and NPCs, the system remains symmetrical for PCs and NPCs while cutting out a large amount of extra fiddly checking. All damage dealt is subtracted from a creature’s hit points. When a creature’s hit points drop to 0 or fewer, the creature is unconscious and possibly dead. The creature’s condition will not be determined until an ally treats its wounds. When this occurs, the unconscious creature must roll 1d20+1d6 on the Mortal Wounds table and apply any appropriate modifiers listed. The modified 1d20 roll determines the unconscious creature’s condition while the modified 1d6 roll determines whether any permanent wounds are suffered. Characters not treated within 24 hours of being unconscious must roll, with no bonus for treatment and at the full -10 penalty for being treated 1 day later. This has the continuity issue that the cleric shows up 10 minutes later, casts Cure Serious Wounds, and then realizes that there’s nothing left of you but a red paste – so at least one set of house rules (that I’d considered adopting) does allow making the roll as soon as you fall to 0. This is a really excellent and useful summary; thanks for making it! The -5 clamp for a single attack is because character and enemy damage in Heroes Against Darkness scales at higher levels, so characters can end up taking enough damage to take them from quite alive to dead-dead without this rule. This is a great, really interesting post! 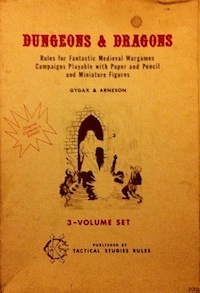 I’d missed the Mortal Wounds table on my skim through ACKS; I’m probably going to start using them (WFRP has instilled a love of that sort of thing in me). One observation, though: your description of the 4E mechanism isn’t entirely accurate. With the Death Saving through, there’s a(n unmodified) 45% chance of failure (with the three strikes), a 50% chance of no change, and only a 5% chance of success. Good catch; my summary of the 4E rule is clear as mud. There is no mention at all of the 5% bounce back chance, for example. I’ll stand by my 55% chance of success though, where success is defined as not slipping closer to death.